We are pleased to tell you about this highly restricted, special edition of Robert Taylor’s famous painting First of Many, depicting the legendary fighter Ace’s first air victory in World War II. 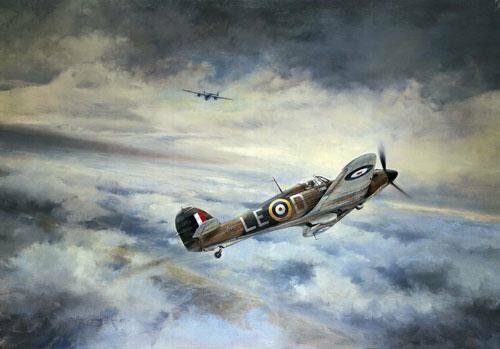 Each print in this special Tribute Edition is signed by four famous RAF Fighter Aces that flew Hurricanes and Spitfires with Douglas Bader in the Battle of Britain in 1940. Sadly, none of these renowned pilots are still with us today. The signatures on this significant print are among the most sought-after by knowledgeable collectors. Few such unique and valuable collector prints are ever offered on the primary market these days, especially when signed by such prominent fighter Aces who excelled in combat in that momentous and decisive period in aviation history. We expect the prints to be quickly snapped up by collectors, so please order your copy without delay, before we become over-subscribed. Air Commodore Pat 'Jamie' Jameson CB, DSO, DFC. Wing Commander Bob Stanford-Tuck DSO, DFC. Group Captain Duncan Smith DSO, DFC, AE. Group Captain Peter Townsend CVO, DSO, DFC.